Branch is a for-profit socially conscious company based in San Francisco and Nairobi. It prides itself in using technology to dramatically reduce the cost of delivering financial services in emerging markets. Their first product is credit. 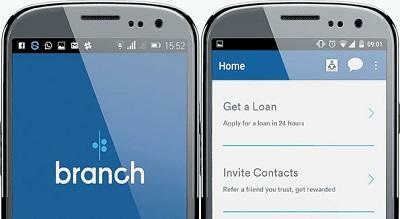 Branch is like a bank in your pocket, there for you at all times. It is also considered as a Facebook-linked mobile application that allows users to borrow and repay micro-loans through Safaricom’s mobile payments service M-pesa. You must be a registered and active M-pesa user. You must possess an active Facebook account. Accumulation of more SMS and M-pesa transaction messages on phone. Stay current on all other loans. Download and install Branch app from Google playstore. Link the app to your Facebook account. Fill in the required details (M-pesa number, National ID names and number). Verify your account by clicking on the link that will be sent to you via SMS to your phone. For Branch loans no paper work, collateral or office visits needed. Minimum amount that is loaned is Kshs.1, 000. The repayment period is 3 equal weekly installments. Loan interest rate is dependent on the repayment of the weekly installments by due date which will ultimately INCREASE credit score and DECREASE the interest rate. Branch has various advantages; it eliminates the challenge of getting a loan by using data on your phone including your M-pesa SMS history to verify your identity and create a credit score. They encrypt the data you choose to share with them to protect your privacy. Their fees are clear and easy to understand. Their terms allow for easy repayment. They do not charge late fees or rollover fees. The more you use Branch, the better it gets. Their loan increment eligibility is according to your repayment behavior. Meaning as you pay back on time, their fees decreases, and you unlock larger loans with more flexible terms. Once you complete your application and you qualify for a loan you get it in a matter of minutes. Branch has also got some disadvantages; Loan default penalty is decrease in the Branch credit score, inability to get larger loan amounts, loan denial for 7 days or longer, report to the CRB. Their loan repayment period is also very short and unfavorable for those who need time to be able to repay the loan. As a first time borrower you may not be able to calculate your loan interest as it depends on your creditworthiness which can be very high till you can create a good credit score. Branch loans are quite recommendable for customers who need micro loans urgently and can make their terms of payments. Customers who need larger loans need to check out other institutions that are quite capable of providing such. Branch prides itself in providing funds you need to attain your goals and hence a good option when it comes to borrowing small loans.